Jostein Gaarder: my op-ed was not anti-semitic only "legitimate Israel-criticism"
"Five years after the fact and Jostein Gaarder has not learned a thing. He is considered an intellectual." Five years after having written one of the most ludicrously anti-Semitic op-ed’s in Norwegian history, Jostein Gaarder still considers it to have been an expression of “legitimate Israel-criticism”. "There is no turning back. It is time to learn a new lesson: We do no longer recognize the state of Israel. We could not recognize the South African apartheid regime, nor did we recognize the Afghan Taliban regime. 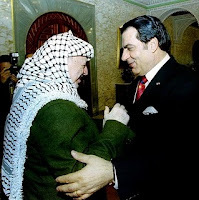 Then there were many who did not recognize Saddam Hussein’s Iraq or the Serbs’ ethnic cleansing. We must now get used to the idea: The state of Israel in its current form is history." "We do not believe in the notion of God’s chosen people. We laugh at this people’s fancies and weep over its misdeeds. To act as God’s chosen people is not only stupid and arrogant, but a crime against humanity." "We call child murderers ‘child murderers’ and will never accept that such have a divine or historic mandate excusing their outrages. We say but this: Shame on all apartheid, shame on ethnic cleansing, shame on every terrorist strike against civilians, be it carried out by Hamas, Hizballah, or the state of Israel!" Context: A Bertrand Russell 'tribunal' to try philosopher Bernard-Henri Lévy for warmongering, unbridled imperialism and Zionism etc., organised by the association the Natives of the Republic (les Indigènes de la République). 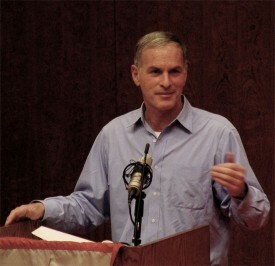 It now turns out that Norman Finkelstein will testify live by video conference from New York at the "trial" to be held this evening in Paris ... He will be a shining star among a bunch of nonentities. - Dissemination of false news likely to sow discord between Christian and Muslim religious communities. "The event featured an antisemitic episode, when one rally leader drank fake blood out of a wine glass – an apparent reference to the libel of Jews drinking Christian blood as wine – to highlight Israel’s alleged brutality. The target of the rally was Dexia, a bank with an Israeli subsidiary. The use of the ugly blood libel motif – codified as antisemitic by Europe’s rights monitoring agency – raises important questions about the relationship between the BDS (boycotts, divestment, and sanctions) Movement and antisemitism." 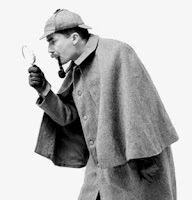 This is not a pipe. This is not a Jew. This is not a Star of David. This is not the flag of the State of Israel. This is not an anti-Semite. This is a nasty Dexia Bank shareholder. 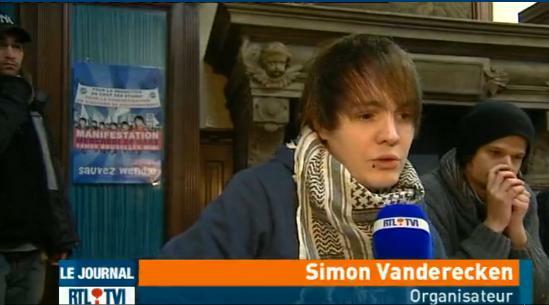 INTAL is a Belgian NGO. One of its main activities is the demonization of Israel and the importation of the Israel-Arab conflit to the streets of Brussels. In May last year INTAL "coordinated" a demonstration against French-Belgian Dexia Bank for doing business in the West Bank "colonies" (this is how settlements are called in Belgium). 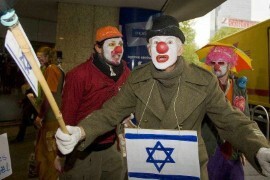 Jews/Israelis were shown as bloodthirsty cannibalistic clowns who enjoy their glass of Palestinian blood. 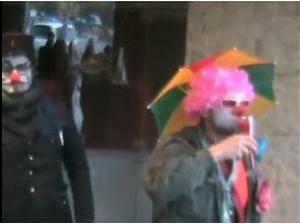 "According to the clowns' own version, they symbolised Dexia shareholders - therefore [!] in no way [!] did they represent either Israel [!] or Jews [!] - who wanted to thank Jean-Luc Dehaene in a playful manner for the lucrative investments make by Dexia in the [Israeli] colonies". 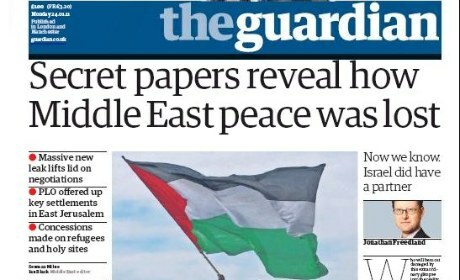 "the Guardian is the most viscerally anti-Israel newspaper published outside the Arab-Muslim world". Surely this statement must mean something coming from France where the media is pretty hostile to Israel too. But the Guardian seems to surpass everybody. Le souk des fuites diplomatiques, Qui veut tuer les négociations au Moyen Orient ? - http://cifwatch.com/ - Monitoring and exposing antisemitism on the Guardian newspaper's 'Comment is Free' blog. 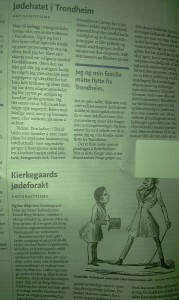 In last week’s edition of Morgenbladet, a man wrote of how he, upon visiting a cafe in Trondheim, was slapped for the sin of refusing to be ashamed of having relatives in Israel. In this week’s issue, a Norwegian Jew writes of how he was repeatedly insulted and criticized in Trondheim for the sin of wearing a t-shirt emblazoned with the star of David. "Also I have have experienced similar disrespect and direct attacks upon my person, solely because I have worn a t-shirt with the religious symbol of the star of David (But it was not yellow as it may-haps should have been?) I expressed absolutely nothing: the attacks and hateful expressions were made for the sole reason that I wore this religious symbol. I was spat upon, harangued and vilely harassed. And the worst was that people in the vicinity followed suit: either with spiteful smiles, shouts and comments, or indirectly by looking away. In spite of France unrelenting long-standing support for Palestinians, this is the second time a French Minister is physically attacked by Palestinians. 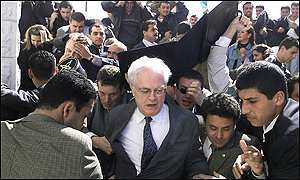 In 2000, a Palestinian mob attacked then French P.M. Lionel Jospin [photo] because of his condemnation of Hezbollah attacks against Israeli targets in southern Lebanon. See Angry Palestinians stone French PM. Recently Lionel Jospin co-signed a letter with other Europeans condemning ... Israel and asking for sanctions (a nice word that means punishment). Robin Shepherd wrote about this : Israel should ban all 26 former European leaders calling for sanctions against Israel, UN imposition of Palestinian state by April. French Foreign Minister Michele Alliot-Marie was attacked by a mob in Gaza on Friday morning. Her attackers were enraged over statements she had allegedly made the day before supporting human rights for kidnapped Israeli soldier Gilad Shalit. Alliot-Marie was mobbed as she entered Gaza, with a crowd surrounding her car, pounding on its windows, and throwing shoes at the vehicle. One person jumped on the car. Two children were pushed in front of the first car in Alliot-Marie's convoy, forcing the convoy to a stop while the attack continued. One sign at the rally had a picture of Alliot-Marie with a red cross over her face. Others called on the foreign minister to leave Gaza. Hamas police eventually stopped the furious protest and allowed the convoy to continue. Hamas leaders expressed sympathy with the rioters, saying Alliot-Marie's comments regarding Shalit reflected a “total bias toward Israel.” Alliot-Marie was not hurt in the attack. 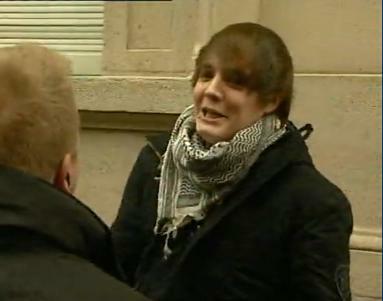 She had met Thursday with the parents of Gilad Shalit. The kidnapped soldier, who Hamas claims to have in custody, holds French citizenship. Alliot-Marie assured his parents that “France has not forgotten Shalit,” and said she would insist that the European Union ask Hamas to allow Red Cross representatives to visit Shalit, as required by international law. According to AFP, trying to 'justify' the incident, the Gaza mob may have mistakenly believed that Alliot-Marie termed Shalit's captivity a “war crime.” Shalit's father Noam had called on France to push the EU to condemn the kidnapping as a war crime, and his statement was wrongly attributed to Alliot-Marie on Israel Radio's Arabic-language website, an AFP reporter said. This has not been corroborated. A Bertrand Russell 'tribunal' to try philosopher Bernard-Henri Lévy for warmongering, unbridled imperialism and Zionism etc. The trial is due to take place in Paris on 28 January. This initiative is a pure product of what is happening in Europe. Among the witnesses one finds British/Pakistani historian Tarik Ali and a Belgian teacher of the prestigious European School, Pierre Piccinin. Another much respected Belgian, Pierre Galand created a kangaroo court to try Israel ... using Bertrand Russell's name too - the Belgian Russell Tribunal on Palestine. 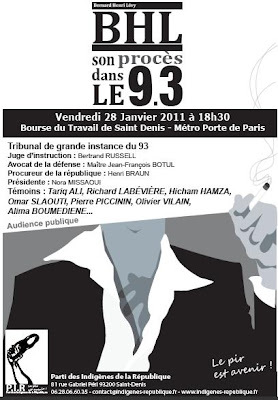 "Pierre Galand (Belgium) Using Political NGOs to Promote Demonization & Anti-Semitism in the UN & EU"
"For years and years, in a haranguing atmosphere full of pedantic pity, part of the media-politico-intellectual "rent-a-thought" elite was blaming the obvious lack of real democracy in these countries on both the Arab-Jewish problem, and on the fact that these countries could not "have a democracy like ours"." French leaders have for long agreed with "experts" that there will be no changes in any "Arab" country, as long as the Israeli-Palestinian conflict has not been settled. I'm referring to "experts" such as geostrategist Pascal Boniface [ADL: French academic and an advisor to the Socialist Party, Pascal Boniface, made the Socialist leaders aware of Arithmetics 101: political decisions should be made according to simple accountancy rules, Arab votes outnumber Jewish votes by ten to one in France, explained Boniface], former minister of foreign affairs Hubert Védrine and their friends of the BDS ("Boycott, Divestment and Sanctions for Palestine") who recently pressured singer Vanessa Paradis into canceling her visit to Israel. Now the Tunisian rebellion has uncovered the plot. The fate of the Tunisian people was indeed miserable, but not because their leaders were transferring many products to the Palestinians to allow them to survive, as I have personally heard the wife of former Tunisian president Ben Ali say in 2002 on the French-language radio station during a stay in Djerba: she spoke of "necessary sacrifices" to support the effort of the Palestinian people. The Tunisians, but also the Algerians, the Egyptians and the Jordanians, are becoming more and more aware, especially when they see on the Arabic tv channels the standard of living of the Israeli Arabs and even the Palestinians, that the money is not going to "the Palestinian children" as has been claimed, but to big cars, a festive lifestyle and opulent villas for the military-fundamentalist mafia which has been leading those countries for decades with Western and Wahhabi support. That is the reality. French officials and intellectuals were not only linking the fate of the North African and Middle Eastern peoples to the Israeli-Palestinian conflict, but submitting it to the condition of a solution for the conflict. The truth is that the conflict has been artificially maintained by military-mafioso dictatorships and their Western accomplices, precisely to prevent a reasonable peace which could eliminate this false argument to justify the misery of these people. And because a solution is made impossible, the blame can be put on Israel. Everything fits. 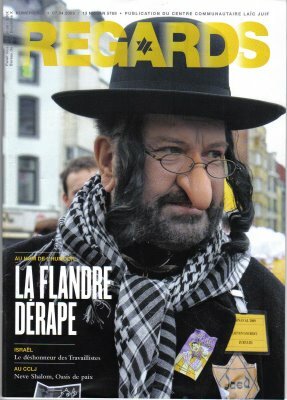 Sadly, Jean-Marie Le Pen is not the only one in Europe to laugh or to speak "scientifically" about Jewish noses. Photo taken at the carnival parade in the Flemish town of Aalst in 2009 (Crooked noses and yellow stars at the Aalst carnival, Belgium). PARIS (AFP)---French extreme right leader Jean-Marie Le Pen handed control of his party to his daughter Sunday with a parting shot that maintained his reputation for controversy, joking about a Jewish reporter's nose. Le Pen was responding to journalists' questions about a reporter [Mickael Szames] who had said he was violently thrown out of a National Front dinner by party security guards on Saturday for allegedly attending without authorization. "He complained it was because he was Jewish he was thrown out. You couldn't tell by looking at his identity card, nor at his nose," Le Pen retorted, evoking a physical stereotype that was notably used in Nazi propaganda. [...]"
Big big spy "scandal" ... Follow Peter de Smet's logic: ""It could be Israel, it could be Russia, it could be England or it could be the U.S.", but while "there is no hard evidence" [his hunch is that] the Israeli spy agency Mossad carried out the eavesdropping operation". Why on earth does he rule out Belgium ? The report states on page 15 that, according numerous sources, the Israeli Interior Ministry is reported to hold a 40% stake in COMVERSE INFOSYS Ltd. and that the Mossad reports to the Interior Ministry . That's big news. Even Wikipedia knows that Mossad reports to the Israeli Prime Minister. Our own reliable sources have indicated that no Israeli government agency holds stakes in private companies. A Belgian intelligence committee's best guess is that Israel was behind an old European Union bugging scandal, a member of the panel said Tuesday. Peter de Smet of Belgium's Standing Intelligence Agencies Review Committee told EUobserver.com that while "there is no hard evidence" the Israeli spy agency Mossad carried out the eavesdropping operation, two people suspected of planting listening devices in the EU member states' headquarters in the mid-1990s had been trained by Comverse. The Israeli telecommunications company allegedly has ties to Mossad. De Smet said there were only a handful of countries that possessed the "really state-of-the-art listening equipment placed in the Justus Lipsius building in 1993 or 1994. "It could be Israel, it could be Russia, it could be England or it could be the U.S. -- there you have really the four countries possible, but it will never blow up who did these things," de Smet said. "It will remain a game inside the intelligence services." The listening devices were discovered by technicians at the Justus Lipsius building in February and March 2003 in sections used by British, French, German and Spanish diplomats, the European Web site said. "GOBIERNO DE ESPAÑA (Government of Spain)"
"MINISTERIO DE ASUNTOS EXTERIOES Y DE COOPERACIÓN ([Spanish] Ministry of Foreign Affairs and Cooperation)"
"AECID - Agencia Española de Cooperación Internacional para el el Desaroll (AECID - [Spanish] Agency of International Cooperation for Development)"
"'We [the Spanish government] don't know about a broadcast that we funded. The Spanish government logo was used without our knowledge.' Following our inquiry (Channel 2 TV's), the Spanish government has opened an investigation to find out exactly what happened." "When we obtain answers [from the Spanish government], we'll be glad to update you." News anchor: "Good evening. A new broadcast on Palestinian TV calls for a boycott of Israeli products - those produced on both sides of the Green Line. Whoever buys them is an accomplice in the killing of Palestinians, according to the ad. This doesn't come as a big surprise. But our political reporter, Udi Segal, reveals this evening that a partner in the funding of this broadcast, this offensive broadcast, is a European country - the Spanish government." Political reporter, Udi Segal: "The Palestinian campaign of incitement against Israeli products has reached a new level. Not only products from settlements, [but] anything Israeli is ruled out, according to a public service advertisement on PA TV." Sadly, Europeans - even European Jews - are just not interested. Spain is facing a terrible economic crisis but the Government will find plenty of money to finance this kind of vile anti-Israel incitement. 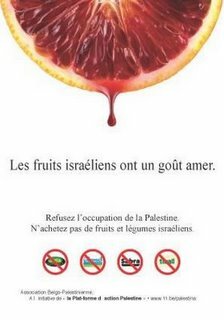 Last week Palestinian Authority TV started broadcasting an ad promoting the boycott of all Israeli products. The ad is sponsored by the Spanish government, the Spanish Ministry of Foreign Affairs and AECID - the Spanish governmental humanitarian aid development. The shopkeeper then ask the boy him what he wants. The boy looks at the Israeli products in the store and says: "I want Israeli chips." He takes the chips, walks to the door, and then hears gunfire, presumably from Israeli soldiers, and he decides that he will not buy Israeli goods. He looks to each side, drops the chips on the floor, returns to the shopkeeper and says: "I don't want the Israeli product, I want the Palestinian product." "The Spanish government, the Spanish Ministry of Foreign Affairs and AECID (Spanish governmental humanitarian aid development), ACSUR (a Spanish non-profit organization), and Canaan Joint Development Project for Jerusalem (Palestinian)." On November 28, 2010, the Swedish program “Kalla Fakta” (Cold Facts) on TV4 broadcasted a documentary about the Swedish Queen’s late father, Walter Sommerlath (1901-1990), and his Nazi past. The factual program raised some inconvenient truths—which the queen is now trying to suppress. Queen Silvia’s father was a German national, who worked in the steel industry in Brazil in the 1920’s. There were many German expatriates in Brazil, and Sommerlath and his brother affiliated themselves with the German Nazi party in 1934. The Sommerlaths joined the National Socialists’ foreign division (NSDAP/AS) in Brazil. In 1938 Sommerlath returned to Germany where he was able, with the help of the National Social Democrats (Nazis), to expropriate a metal factory in Berlin from its rightful Jewish owner, Efim Wechsler. The factory was soon turned into an integral part of the war industry, producing tank parts and anti-aircraft guns for the German army. 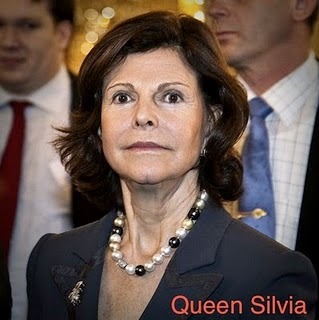 Therefore, Queen Silvia’s father was, in fact, an active Nazi sympathizer who made his fortune by acquiring a factory owned by a Jew, Efim Wechsler. Wechsler, having had his property taken away from him by extortion, and left penniless by further Nazis taxes, was then destitute and forced to flee Germany. Perhaps this was new information for Queen Silvia, who has commented previously that “her father’s involvement in Nazism was neither politically active or as a soldier”. In fact she claimed that her father’s factory produced toy trains and hair dryers and civil defense items. BERLIN (EJP)---The new head of Germany’s Jewish representative body said Jews must move beyond the role of victims and moral critics in German society. Dieter Graumann, who was elected in November President of the Central Council of Jews in Germany, told the Financial Times Deutschland : "The role of the victim is not enough, Judaism is much, much more." "Our community now consists 90% of people who have just come to us in the last 20 years," said Graumann. "With all due respect to honoring the memories of the millions of Jews murdered during the Holocaust, the Council must also show that we do not always just criticize, that we do not always just correct others," he said. "That has something to do with us, but that also has a lot to do with the media, who often virtually challenge us to make such statements. We do not always need to serve this need, however," he added. Graumann, who succeeded Charlotte Knobloch, a Holocaust survivor, acknowledged that moral outrage had become an established ritual for the Council. The new Council president is the first post-war leader who is not a survivor of the Holocaust. I am told not to be alarmed when I encounter aggressive anti-Semitism in Hungary. After all there exists a vibrant Jewish culture in Budapest and there was hope the “conservative” Fidesz government would curb the development of aggressive anti-Semitism - although it is tolerating the implicit and not so implicit anti-Semitism of some Fidesz journalists at present. But Fidesz is supposed to do this only to attract Jobbik voters. A dim hope indeed, when a random sample of Hungarian media proves the continuing anti-Semitic incitement after the overwhelming victory by Fidesz at local and national levels. These and many other bands perform at illegal concerts and at the infamous Magyar Sziget or Hungarian Island Festival. This year this summer camp for “nationalistic youth” was organized for the tenth time. The camp offers national-heritage competitions featuring archery, animal tracking, runic script, Hun cuisine, as well as family and children's programs and with anti-Semitic and racist lectures that deny the historical Jesus his Jewish identity and talk about “Jewish world conspiracy”. "Yet if the main threat is revolutionary Islamism and the collapse of national identity, stability, and democracy, then Europe is in a lot of trouble." "Another development in Europe, however, is rising antisemitism. Here's an article providing examples of both sympathetic and unsympathetic reactions on the issue by various Dutch figures. Having reliable statistics at last regarding the number of Muslims in Europe also makes it timely to discuss that issue. The European left often argues that Muslims face imminent persecution and even massive repression. One of the more sophisticated versions of this theme comes from the Dutch Labor Party journalist and intellectual Geert Mak in one of the country's leading newspapers: "No, in the comparison between Jews and Muslims it's not about deportation and mass-murder. It's about the beginning, about the 1930s, when Jews felt themselves excluded and when it was spoken about them as it is now about Muslims." Yet how can one deal with this issue without noting the fact that Islamists who are Muslim have committed more than 10,000 terrorist attacks in the last two decades? Or the fact that in many mosques in the West, preachers systematically incite hatred for Jews and Christians? Or that a whole series of special privileges are demanded by local Muslim leaders that break the Western democratic tradition of equal treatment under law? Or that the overwhelmingly main cause of growing antisemitism in Europe comes from the Muslim sector of the population? Needless to say, Jews in the 1930s weren't doing any of these things. There was not a single incident of violence by Jews against the Christian majority. While Jews were sometimes accused of religiously preaching hatred against Christians, those claims were always false. And far from asking for special privileges, most Jews were trying desperately to assimilate culturally while the rest only wanted to be left alone. If one ignores these differences it is impossible to understand the situation today. Here's one little detail reported by the French press agency, AFP that provides an ironic example of the problem. A Lebanon-born Swedish citizen named Munir Awad was arrested in Somalia in 2007 and again in 2009 in Pakistan on suspicion of involvement in terrorism. The Swedish foreign ministry helped get him freed on both occasions. Awad expressed his gratitude. Now Awad has been again arrested--in Sweden--after participating in a plot to "kill as many people as possible" in an attack on a Danish newspaper that published cartoons he found objectionable.